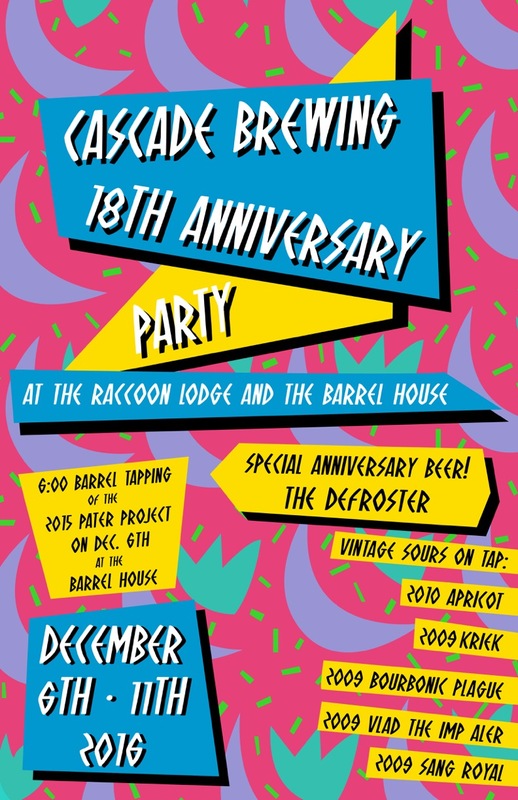 Cascade Brewing Co. is turning 18 and you're invited to their birthday bash! The 18th Anniversary Party will take place at both Cascade Brewing Barrel House and Raccoon Lodge & Brewpub from December 6 - 11. Rare vintages will be tapped and available for sale in bottles. For more details, check out the brewery's news release below. Happy 18th Anniversary to the House of Sour! Zupan's and Coalition just announced the 4th release of Zupan's private label Farm-to-Market beer. This year's installment, Whiskey Barrel Aged Imperial Stout, began life as Farm to Market Imperial Coffee Chocolate Stout (released last November) and spent the last year slumbering in Bull Run Distilling Temperance whiskey barrels. 20 pounds of Woodblock Chocolate from Tanzania were thrown in for good measure. This is a very limited release—only 250 bottles (750 ml) priced at $19.99 are available. If you're interested, head down to one of Zupan's four locations and pick up a bottle or two. I expect this would pair nicely with decadent Thanksgiving desserts! For more details, check out the news release below. 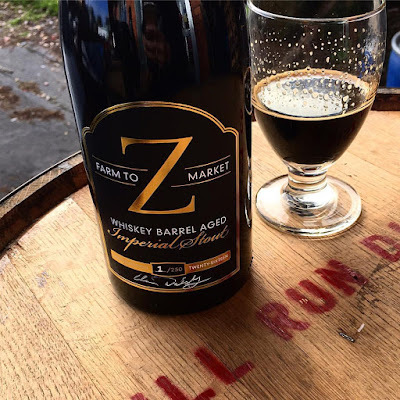 PORTLAND, Ore (Nov. 14, 2016) – Zupan’s Markets has partnered once again with Coalition Brewing Co. to release the fourth Farm-to-Market beer in its private label line. This special edition stout was created by aging our Farm to Market Imperial Coffee Chocolate Stout (released in November 2015) in Bull Run Distilling Co. Temperance whiskey barrels for a year. The result of aging has produced a silky midnight black stout with balanced notes of whiskey and vanilla supported by chocolate and Chilean coffee. “Zupan’s Markets was excited to experiment with our first barrel-aged beer and add a product to this fast growing category” said Zupan’s Markets’ President and CEO Mike Zupan. "The flavor profiles of our original coffee chocolate stout together with local whiskey barrels was a natural match." This special edition Imperial Stout is available now at all four Zupan’s Markets locations in 750 ml bottles for $19.99 With only 250 bottles produced, it will be on shelves only for a limited time. Perfect to drink now and save a bottle to lay down to continue to age. Founded by John Zupan in 1975, Zupan’s Markets is a local and family-owned gourmet market that has served Portland’s food-loving community for more than 40 years. Zupan’s Markets has four locations that focus on quality, selling everything from the best meats and wines to the freshest produce, baked goods, gourmet deli products, specialty foods, flowers and more, always emphasizing locally-sourced, artisan products when possible. For more information, visit www.zupans.com. It may not officially be winter yet, but winter seasonal beers are here! Pyramid Brewing is celebrating the season with Snow Cap, its long-time winter brew. But this year, for its 30th Anniversary, the brewery is releasing two additional variations of Snow Cap. Super Snow Cap is an Imperial version that is being released in 22 oz bottles for the first time. Bourbon-Barrel Aged Snow Cap is a blend of Snow Cap and Super Snow Cap that was aged in bourbon barrels for 10 months. Both Super Snow Cap and Bourbon Barrel Aged Snow Cap are being released in limited quantities. So if you see them, act fast! For more details, check out Pyramid's news release below. SEATTLE – Pyramid Breweries announced the launch of not two, but three special releases in celebration of the 30th Anniversary of Snow Cap. 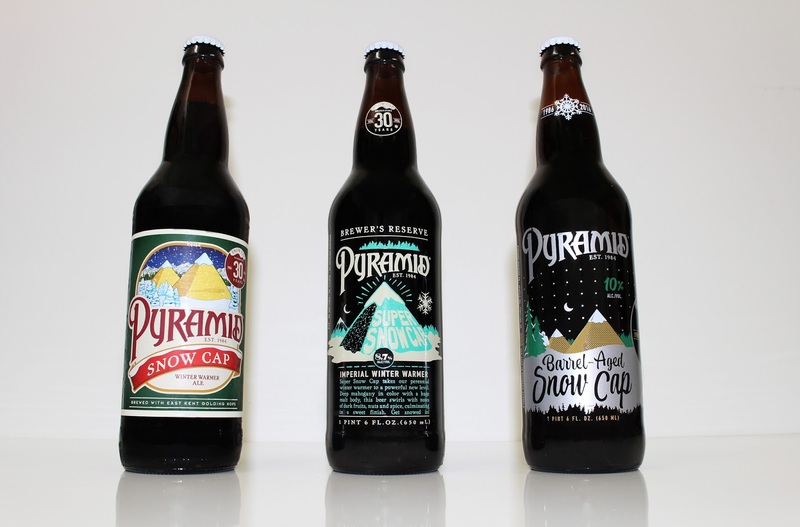 Snow Cap, Super Snow Cap and the limited release, Bourbon Barrel-Aged Snow Cap, make up Pyramid’s Snow Cap family of brews to celebrate this meaningful milestone three decades in the making. The anchor of the seasonal trio, Snow Cap, is Pyramid’s full-bodied winter warmer and is brewed in the spirit of British winter ales. Deep mahogany in color and crafted with a flurry of roasted chocolate and caramel malts, and generously hopped, it delivers a smooth finish that makes this beer the ideal combination of warmth and refreshment. Grand Rapids, Michigan-based Founders Brewing Co. just announced they will begin distributing in the Great Northwest in 2017. Founders was our nation's 20th largest brewer, based on volume, in the 2015. I've had a handful of Founders beers during my travels to the Midwest, and have enjoyed all of them. I even profiled Founders Breakfast Stout a few years ago. For more details, check out the brewery's news release below. 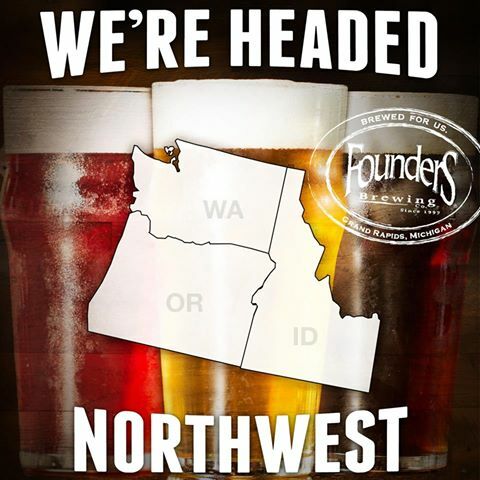 Welcome to the Northwest, Founders! We are humbled and honored to announce that we will be bringing our beer to a long-admired craft beer mecca, the Pacific Northwest states of Washington, Oregon and Idaho! It was westward that our Co-Founders traveled in their discovery of craft beer some 25 years ago and we’ve long anticipated the day that our beers would be available in this region. With the help of the Great Artisan Beverage (GAB) network of wholesalers, residents of these fine states can expect to see our year-round, seasonal and specialty beers in bottles, cans (as applicable) and kegs beginning in January with our Washington launch. Select limited release beers may also be available at craft retailers following the launch. Idaho and Oregon will be right behind Washington with beer hitting shelves in February. With a launch this epic you can be sure that we will be hosting some awesome events. Washingtonians can expect launch events in the Seattle area January 10-12. Stay tuned to our events page for more information regarding launch events in Oregon and Idaho. Be sure to follow us on Twitter, Facebook and Instagram for more information. To see all the states where we are available and to find beer in your area, check out our beer finder. Note that new markets may take up to 60 days to show up on the beer finder. PacWest, we will see you soon! The 21st installment of Portland's Holiday Ale Festival returns to Pioneer Courthouse Square November 30 - December 4. It looks like another great event is in store! At the end of this post is a list of interesting facts, provided by event organizers, to whet your appetite. Ticket packages start at $35 per person ($100 for VIP). Check the festival website for details. The taplist, complete with beer descriptions can be viewed and downloaded here. Limited release offerings will be announced as the festival nears. Check out my Beer Festival schedule page to learn more about other great events! • 21st year of the festival; it was founded in 1995 as the Winter Ale Festival, ran for two years, then took a hiatus in 1997. 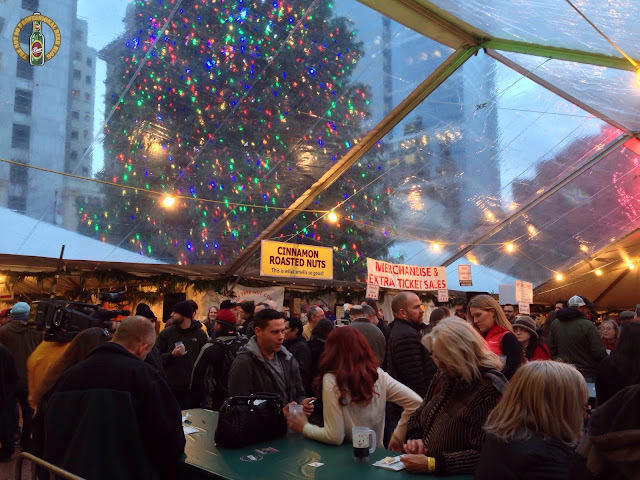 It returned as the Holiday Ale Festival in 1998 and has run consecutively ever since. • 53 craft beers and ciders are poured in the main festival. • Up to 16+ limited special tapping beers will be available Wednesday through Saturday, typically tapped at two different times per day at the three main bars. These tappings will be promoted via the website and social media. • There will be an additional number of limited specialty beers offered at Meet the Brewer events on Wednesday through Friday at the upstairs Brewer’s Lounge. These events will also be promoted via the website and social media. • The festival has a user-friendly real time mobile website that provides up-to-second updates on beer tappings and locations. Just go to holidayale.com on your phone and choose mobile version (the website will auto-detect a mobile browser). • There are nearly as many beer styles represented as there are breweries. • The lowest alcohol products is 54° 40' Brewing Co.’s de Prune Oud Bruin at 5.2% ABV. • The highest alcohol product is Falling Sky’s Satyr Sauce Smoked Barleywine at 12.5% ABV. • These are big beers & ciders, with 35 coming in at 8% ABV or higher. • More than 650 beer lovers volunteer at the festival. • More than 14,000 attendees annually visit from all over the country. • All beer and cider will be served in Govino tasting glasses made from a flexible BPA-free polymer that properly showcases the beverages; these glasses are shatterproof, recyclable and reusable. • There are two on-site food vendors, including Urban German Grill and another TBD. There are also fresh roasted nuts and self-guided cheese pairings available. • $20,000 was donated to the Children’s Cancer Association in 2016. The festival matches, then quadruples, the proceeds from all designated driver tickets, the soda garden, the bag and coat check and raffle sales. Those proceeds are donated to the Children's Cancer Association’s MyMusicRx program, which delivers the healing power of music to children battling cancer and their families. Pyramid Ditto Session IPA + $100 Pyramid Taproom Gift Card Giveaway! 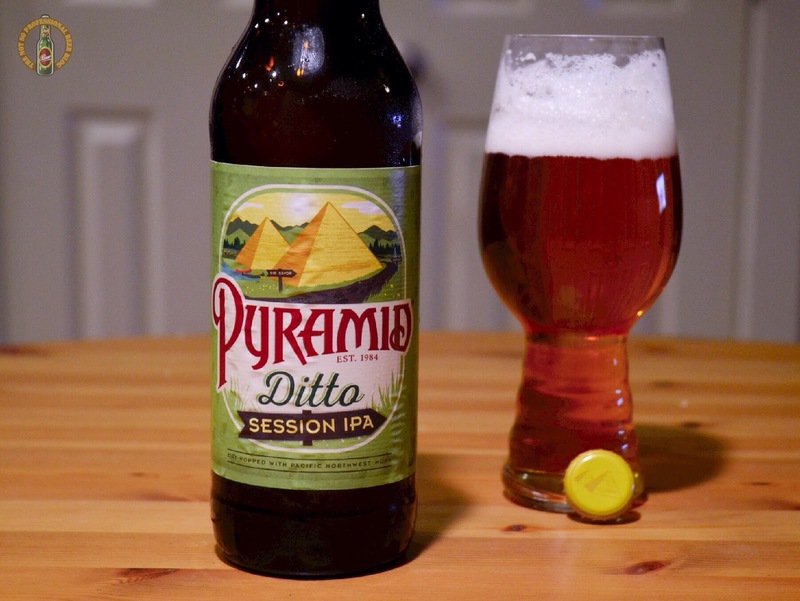 Pyramid Brewing Co. recently announced the launch of Ditto Session IPA. To celebrate the release, the brewery sent me a $100 gift card to the Pyramid / Portland Brewing Taproom to give away free to one of my lucky readers! But before I talk about the giveaway, I’ll give you a few details about Ditto Session IPA, based on a sample the brewery sent me. Ok, now for the contest. It’s really simple! I’ll conduct a drawing (using a random number generator). To enter the drawing, follow Pyramid on Instagram (@pyramidbrew). Then provide your name, Instagram address, and the name of your favorite Pyramid beer in the comments section of this post. All entries must be posted by 12 pm (Pacific time) on Sunday, November 13. I’ll check to verify that the winner follows Pyramid on Instagram. There’s a limit of one entry per person. Good luck! Thanks to Pyramid for sponsoring the giveaway for my readers! I love Imperial Stouts. Good ones are rich, full of layered flavors, and great for warming up on a cold winter day! 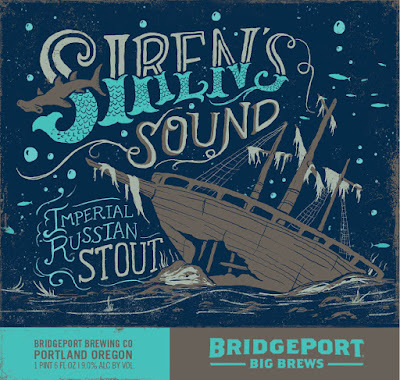 BridgePort Brewing Co. just announced the release of Siren's Sound, a new Imperial Russian Stout that will be available on draft and in 22 oz. bottles during November. Check out the press release below for all the details about the latest in BridgePort's Big Brews series. 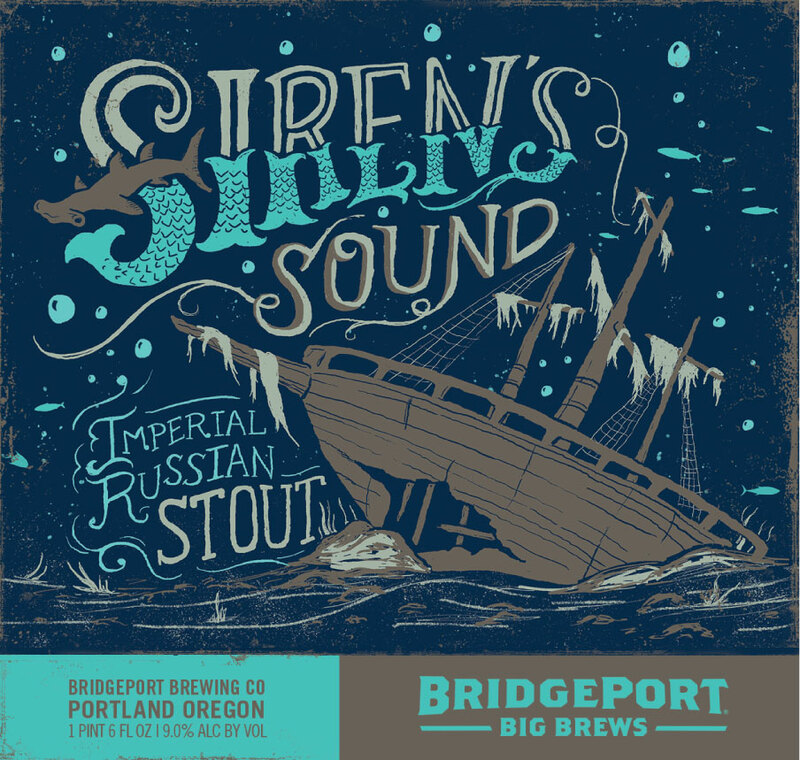 Photo courtesy of BridgePort Brewing Co.
PORTLAND, Ore. – November 1, 2016 – BridgePort Brewing Company, Oregon’s original craft brewery today announced the release of Siren’s Sound, an Imperial Russian Stout, available in bottles and on-draft in November. 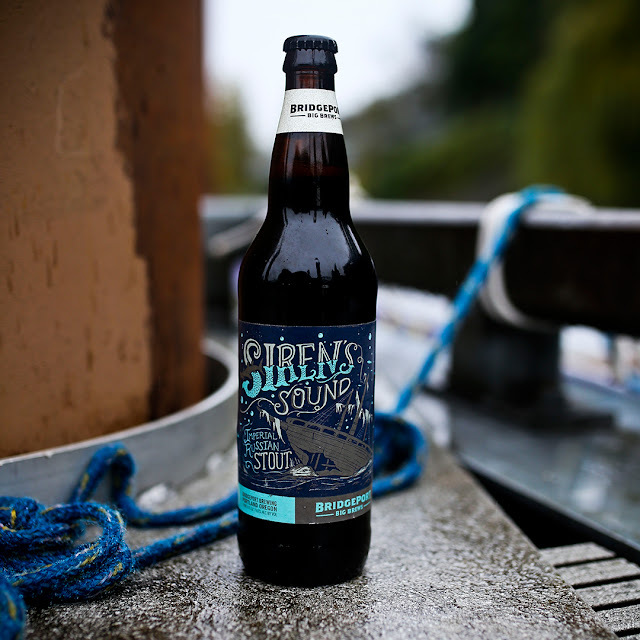 With leaves changing and rain falling, this big stout is the perfect dark beer to ring in this season in the Pacific Northwest. Siren’s Sound was brewed to be a little devious, just like the Sirens of lore. BridgePort’s brewers used a monstrous amount of De-bittered Black Malt, Midnight Wheat, and roasted barley to create a beer with a huge flavor profile and a sneaky 9.0% ABV and 75 IBU. Bringing balance to the brew, brewers used Sterling Hops in the kettle and finished off the beer with a dry hop dose of Mt. Hood’s for a special twist on this Imperial Russian Stout. In addition to the new Siren’s Sound, BridgePort’s distinctive holiday brew, Ebenezer Ale, is back for the 17th year. Derived from four different roasted malts and a blend of local and imported hops, Ebenezer is a strong ale complemented by a smooth complex palate. Pour Ebenezer in your glass and you’ll experience a full-bodied, deep mahogany colored brew with a malty first taste that finishes with delicious caramel notes. Siren’s Sound and Ebenezer Ale is available in limited quantities on-draft and in 22oz. bombers at BridgePort BrewPub (1313 NW Marshall St., Portland, Ore.) and where BridgePort is sold in the Pacific Northwest.